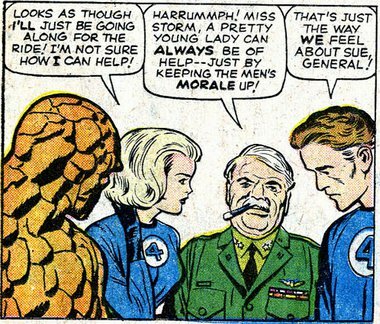 Ah, Reed Richards. 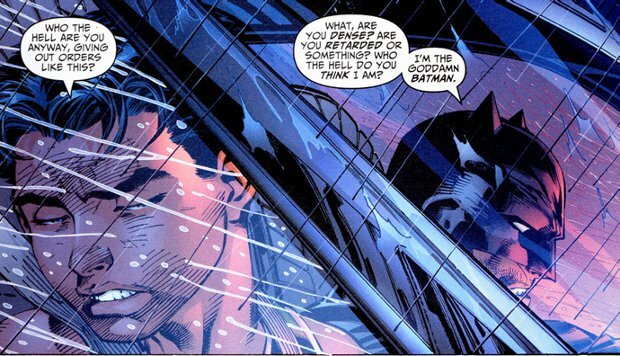 Few characters have been as consistently portrayed as sexist, in mainstream superhero comics. 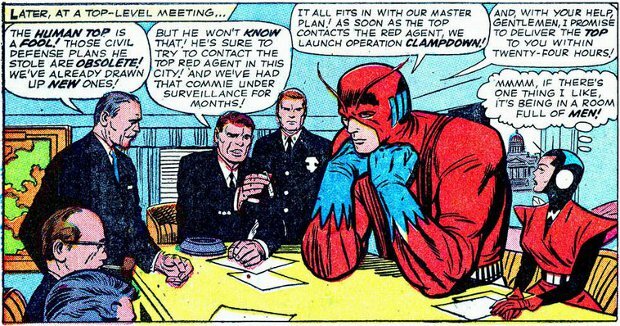 It’s probably because he and Sue were one of the first “real” couples in superhero comics: they were already dating in the very first issue, and were married in the third annual (1965). Therefore, all the “morals” of the late 50s and early 60s could be seen in their relationship; other couples typically came much later, and the moral zeitgeist had, by then, progressed. 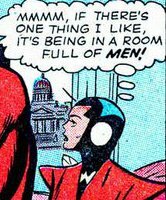 Here we see another great example: Reed (and he isn’t depicted negatively, therefore Stan Lee seemed to agree, at the time) treats Sue as if he was a parental figure (instead of a boyfriend, which he was at the time), and insults her entire gender by saying that women are “too scatterbrained and emotional to realize” how, basically, men know best. In other words, according to this view, women should look up to men, including steady boyfriends and husbands, in much the same way as children look up to their parents, trust them implicitly, and obey them, because parents are adults and are, therefore, the only ones who can be rational and responsible. 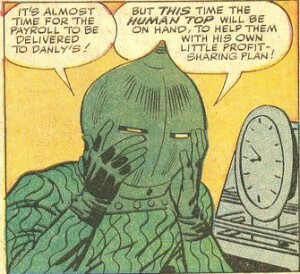 And what’s worse is that, in the next panel… Sue agrees! 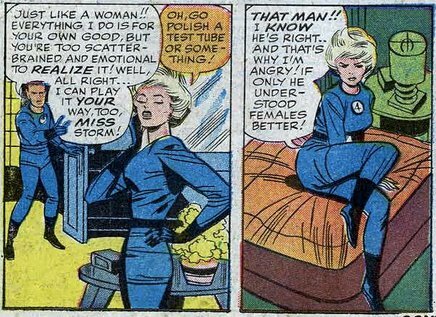 Even though she challenged Reed in the previous panel (with, you’ll note, a childish retort: “go polish a test tube or something!”), after she leaves she admits to herself that Reed was right, that he really knew what’s best for her, and that she — like all women — only didn’t accept it at the time because she’s “too scatterbrained and emotional”. 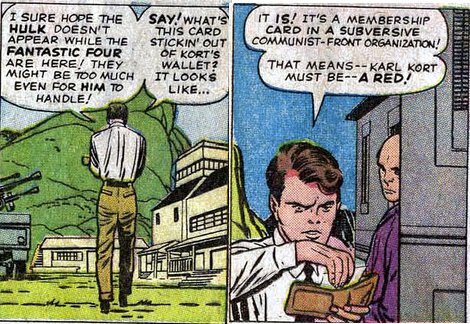 I could have stretched this one into two separate posts, but since they would both concern the very same character (again, much like Karl Kort, never seen again after this story, sadly), and are from the same story, I chose to do a “two-in-one” with the best / worst two panels featuring this fascinating “yellow peril” villain, General Fang, featured in The Incredible Hulk #5, from 1962. Most leaders, even actual dictators, typically have advisors. But not Fang. Nosiree. He is far above that. But Fang, reminding me of a couple of bosses I had in the past, knows how to deal with those pesky outside contributions. 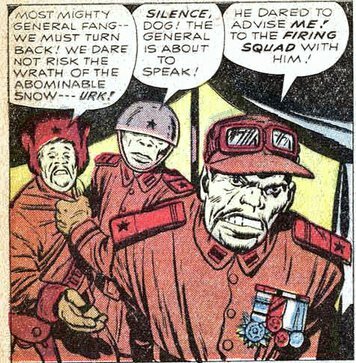 I bet the other guy, the one with the simian look and the ridiculous huge bowl with a star, will not ever think, in the future, of offering the slightest suggestion to his most glorious general! 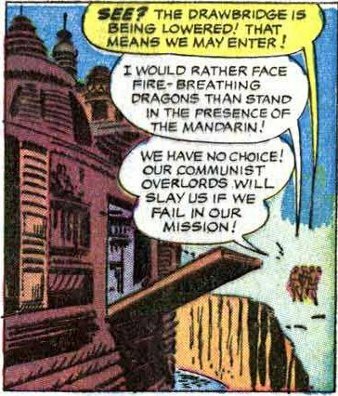 The next panel comes a bit later in the story, after Fang has ordered the launch of his missiles into the peaceful neighboring country of “Llhasa”, which is of course not meant to be Tibet (whose real-life capital is “Lhasa”, with just one “L”), perish the thought. Would YOU be foolish enough to survive his missile attack? 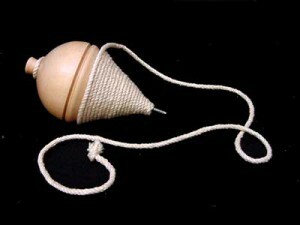 Come on, spit it out. Would you? 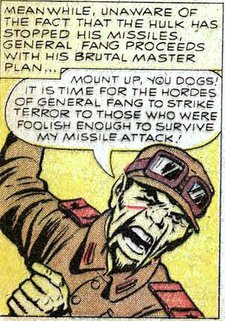 As the caption in the panel says, the Hulk stops the missiles, but Fang doesn’t know that yet, and so he orders his cavalry (just the right choice for attacking snow-covered mountains, I guess) to attack, and to “strike terror to those who were foolish enough to survive (his) missile attack“.